Forest land on Martha's Vineyard is perforated by houses. Harvard researchers caution that careful planning is needed to protect Massachusetts forests, and the ecological services they provide. Massachusetts is in the midst of a new wave of deforestation. The first wave came back in the 1800's when the land was cleared for farms and pasture. Many of those forests have since recovered. In fact, there's more forest in New England now than at any time in the past 200 years. Sixty percent of Massachusetts is forested, down from an impressive seventy percent in the 1970's. All six New England states rank in the top ten most forested states in the nation. But a new study by researchers at Harvard University indicates the forests are at a tipping point. This time, the threat is sprawl. And the fact that Massachusetts has so much forest land means we stand to lose big from deforestation. Forests are more than pretty landscapes and nice places to take walks. They provide critical services, like filtering drinking water, creating wildlife habitat, and storing carbon that would otherwise warm the climate. When forests are fragmented, or perforated, by development, their ability to perform those functions is reduced. Results from the Changes to the Land report show how increased water runoff contributes to stormwater and flooding risks across the 4 land-use scenarios. That Massachusetts forests are threatened by development is no surprise. What's unique about this study is the level of detail included in four future scenarios the research team produced. Species by species, acre by acre, scientists measured how sprawl impacts flood control, wildlife habitat, carbon storage, rural timber economies, and more. 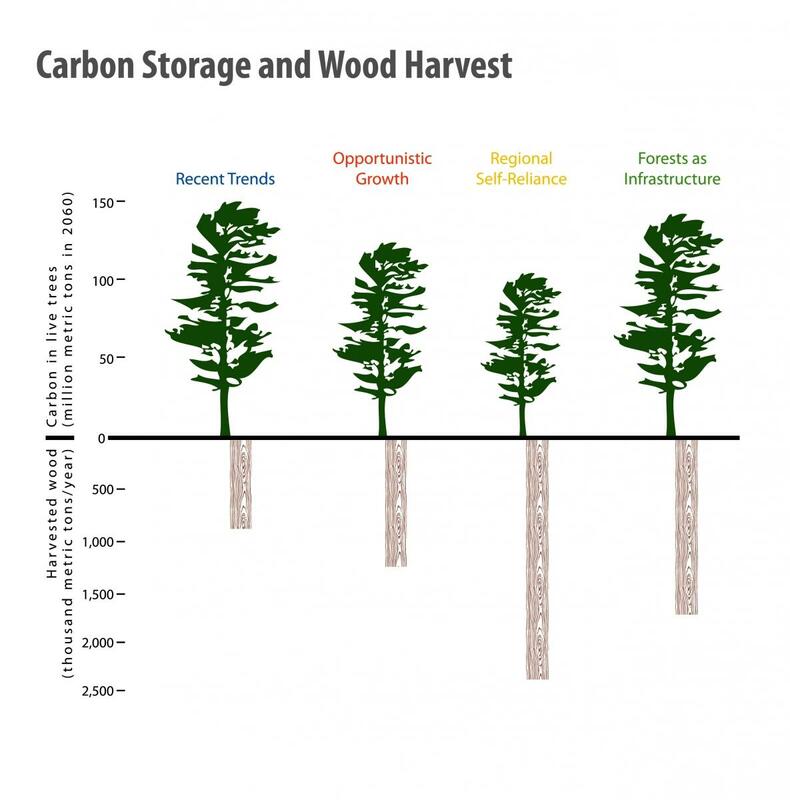 The Forests as Infrastructure scenario shows that it is possible to harvest twice as much wood while maintaining nearly the same level of carbon storage in live trees. They then used that information to model four possible futures for Massachusetts forests. A worst-case scenario was built around the possibility of further development with less emphasis on forest conservation. The researchers also modeled two 'greener' options - one in which rising fuel prices make local food and energy production the top priorities, and one in which we place the highest value on forests, themselves. They call this last one the "Forests as Infrastructure." In the study, these scenarios are ranked based on their performance on nine benefits to humans and nature - the previously mentioned ecosystem services. What the study doesn't take into account are some of the broader ramifications of the choices inherent in the four scenarios. For example, they measure the loss in carbon absorption that would result from clearing forests for farming, but don't weigh that against the carbon savings of growing food locally. The researchers are careful to point out that the scenarios are not predictions. Rather, they are roadmaps that provide an idea of the likely results of different approaches to future development. We could proceed haphazardly, or we could begin to think about our forests as infrastructure - like roads or sewers - and take deliberate action to maximize the economic, ecological, and social benefits of forests.